Poster advertising two showings onTuesday, October 24 of the movie A Luta Continua and of VIVA FRELIMO produced by Dutch Kenmark TV, a study of the Mozambique Liberation Front, its political organization, and programs of national reconstruction inside liberate Mozambique. 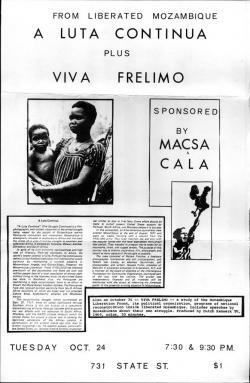 The poster says the showings are sponsored by MACSA (Madison Area Committee on Southern Africa) and CALA (Community Action on Latin America.). Size: 16.75 x 11 inches.